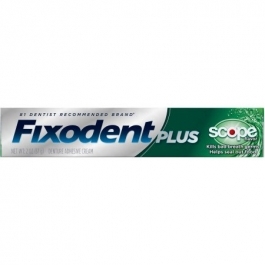 New Fixodent Control Plus Scope Flavor gives you fresher breath* so you have the confidence to handle any situation. That's because Fixodent Control Plus Scope Flavor kills germs that cause bad breath without compromising the great hold you've come to expect from Fixodent. Plus, the Precision Tip nozzle gives you the control to apply just the right amount where you want it, for: hold with less ooze, help sealing out tough food particles, great fit and strong long hold. *Versus no adhesive. Clean and dry dentures thoroughly before applying. For best results, apply Fixodent Control Plus Scope Flavor in a continuous line along the perimeter of both dentures and two lines in the center of the upper denture. Rinse mouth before inserting dentures. Press denture firmly into place and hold briefly. Detailed instructions inside.